This, unfortunately, is not simply a philosophical question best suited for consideration with like-minded colleagues in the early hours of the morning. Rather it is a highly practical issue of concern to anyone measuring particle size. The image above is a Malvern favourite, taken from ‘Basic principles of particle size analysis’, one of our most popular reads. It highlights two key issues at the heart of particle size measurement. Firstly, if you look at the image in the centre you quickly realise that the size of this particle cannot be properly described with just a single number – only a perfect sphere has that distinction. Secondly the image makes clear that there are many single numbers and diameters that are equally valid, equally descriptive, but not the same. The value you measure as the ‘particle size’ therefore depends on your technique; and the most appropriate technique depends on your application. A problem people often face when looking to change analytical methods is that the new results don’t agree with the old ones. Where performance is correlated with previous data this can be a significant issue, and one that inhibits the adoption of newer, more versatile techniques. Back to this favourite image of ours: it tells us that we shouldn’t expect particle sizing results from sieving, for example, to be identical to those from laser diffraction. But, if laser diffraction is suitable for the sizing application, then performance can be correlated with laser diffraction results. Either correlate performance directly with the new data, or correlate the old and new data, whichever is easiest. The initial effort to put such correlations in place is worthwhile if there are strong arguments for using a new technique. When it comes to laser diffraction, its use is so widespread that there is extensive support for anyone looking to make the change. Whatever descriptor we choose for particle size there are also different options for presenting distribution data. We can count particles lying in a defined classification, or weigh them, or determine their volume (the same as weighing if particle density is independent of particle size). This choice will have a considerable impact on the results. Take imaging and laser diffraction, for instance: two techniques routinely used side-by-side. 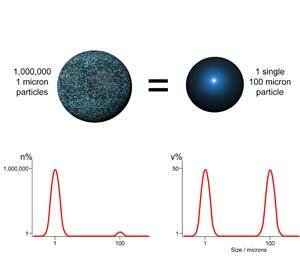 Imaging techniques capture 2D images of individual particles, and from these count the number of particles which have a specific diameter, thus classifying the particles into a size distribution. Laser diffraction, on the other hand, is an ensemble technique which calculates the size distribution of a sample by measuring light scattering data. The mathematical calculations used to determine the size distribution, combined with the design of the detection system, mean that laser diffraction systems report the volume of material within each size fraction, rather then the number of particles. This can cause considerable differences in the reported size distribution. As the simple example below shows, the volume distribution for a sample will always be shifted towards larger particle sizes compared to the number distribution, as it is the larger particles with a sample which contain most of the volume of material. So, in this case, laser diffraction would show there to be the same amount of material at 1 micron and 100 microns, as the volume of the one million 1 micron particles in the sample is equivalent to the volume of the single 100 micron particle. At Malvern we routinely compare data from imaging and from laser diffraction data. This can be very informative during analytical method development, or as a product makes the transition from development to commercialisation, when analytical demands often change. The key is to make sure that you are comparing like with like. Over the next few months I’m going to consider some of the reasons why people switch from older analytical techniques such as Blaine, sieving, gas absorption and electrozone sensing to laser diffraction and more importantly the support that we can offer in making the change. The benefits of change can be enormous, as the first example I’ve chosen will show. In the cement industry, moving from the Blaine method for fineness determination to laser diffraction particle sizing is opening opportunities for real-time measurement and automated control, delivering substantial energy efficiency gains. This is great news for both the environment and the bottom line.